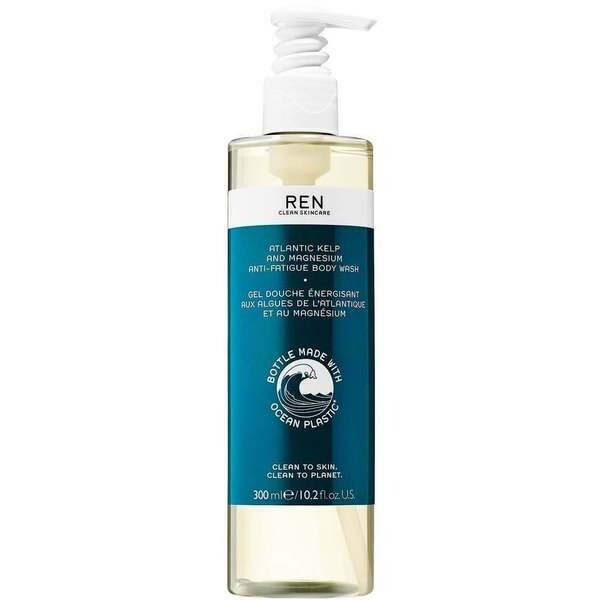 The award-winning REN Atlantic Kelp And Magnesium Anti-Fatigue Body Wash. In a pioneering 100% recycled bottle, with 20% reclaimed ocean plastic. In the shower or bath, massage and lather a generous amount over the body with your hands or the help of a loofah, then rinse thoroughly. Follow with Atlantic Kelp and Magnesium Anti-Fatigue Body Cream. Suitable for all skin types. A sulphate-free reviving body cleanser formulated with Atlantic Kelp Extract and energizing Magnesium PCA with moisturising properties to help nourish, smooth and tone skin. Infused with REN’s exclusive Anti-Fatigue Essential Oils blend will awaken and refresh sluggish skin as well as your senses, for REN’s ultimate uplifting shower experience. Bioactives include: Laminaria Digitata (Kelp) and Magnesium PCA, which are rich in minerals and help boost energy production, Plankton Extract which helps to reduce stress damage within the skin, Sage, Cypress, Geranium, Rosemary to give it a fresh, energising and uplifting scent.